There is no greater gift than the gift of time. Volunteers are the backbone of our ministry. We have NO PAID EMPLOYEES. 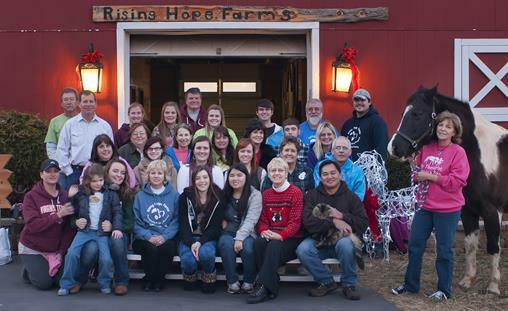 We are very proud of our volunteers and appreciate the love and care they show our riders, families and horses. Starting in April we offer riding sessions on Tuesdays and Wednesdays in the afternoon during the school year (mornings in the summer) and on Saturdays in the mornings. Each riding session is an hour long. If you have a little extra time on any or all of those days and would like to make a difference in the lives of our riders, please consider volunteering. All volunteers go through training, work with experienced volunteers, and are very well prepared to work with the riders and horses. Horse Handler : Must be trained by Rising Hope Farm personnel. Primary responsibility is the horse. The Horse Handler arrives 45 minutes to an hour before the riding lesson to brush, tack and warm up the horse. This allows the horse leader to determine the attitude of the horse and helps both the horse leader and the horse to be comfortable with each other before the rider arrives. During the lesson, the horse leader leads the horse as they watch the body language of the horse to make sure the horse remains calm. 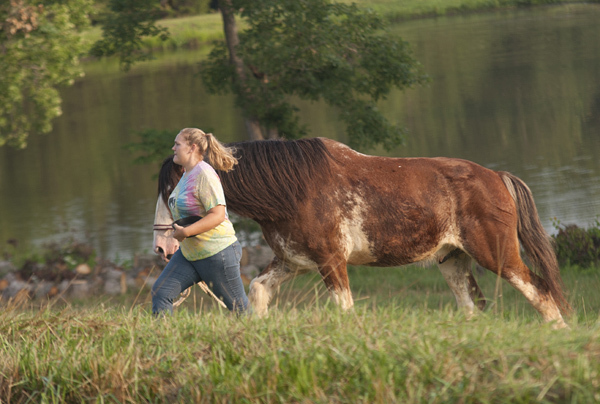 Horse Leader volunteers must be at least 16 years of age and have successfully completed the horse handler training. Side Walker : Primary responsibility is the rider. Side Walkers are requested to be at the arena 30 minutes prior to the riding lesson for which they are scheduled. Side walkers get the most hands-on duties during the therapeutic riding lesson. The Side Walker is located at the side of the horse holding and supporting the rider. Most riders require a side walker on each side. Supporting the rider is the Side Walker’s ultimate responsibility. 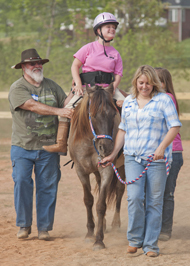 The Side Walker can also help the instructor in assisting with the therapy while in the arena. The Side Walker’s attitude and demeanor needs to be calm and confident so the rider will feel safe. Side Walkers must be at least 15 years of age. Arena Helper: The primary responsibility of the Arena Helper is to assist the instructor with set-up and completion of activities during the riding lesson. The Arena Helper, when not needed in the arena can assist with other responsibilities in the arena, which may include sweeping, organizing and cleaning. Arena Helpers must be at least 14 years of age. Barn Helper: The primary responsibility of the Barn Helper is to assist the Barn Leader with the duties necessary to make a clean and safe environment for volunteers and horses. This may include such activities as helping to maintain and organize tack, cleaning stables, troughs and breezeway. Supervised barn helpers may be asked to assist with brushing and tacking of horses. Barn Helpers must be at least 14 years of age. Gate Keeper : The primary responsibility of the Gate Keeper is to open and shut the gates as the rider and volunteers enter and leave the riding arena. The Gate Keeper is also available to assist the instructor and keep the arena free of horse “droppings” during riding lessons. Administrative Helper: These volunteers do not have to be present during the riding session but help with scheduling other volunteers for the sessions and ensuring all paperwork is complete. Most tasks can be done over the phone or from your home. We need help in mailings, fundraising events, publications, etc. Special Event Volunteers– These volunteers are responsible for helping plan special events such as barbeques, horse shows and fundraisers. We hope to have two events a year to showcase our riders, program and to promote community awareness. The forms can be submitted when participating in the volunteer training. IMPORTANT: All volunteers (over 18 years of age) much have a current background check. Please download the instructions below to obtain a background check at a fee of $12.50. We use PDF forms that can be filled out and printed. Please click here if you do not have adobe Reader installed. When a friend asked me to consider volunteering at the Farm, it sounded like a fun thing to do. I would be getting a little exercise, enjoying the outdoors, and maybe helping a special-needs person in the process. Little did I know, it would become one of the highlights of my week. Getting to know and work with the riders and other volunteershas been a special kind of joy.These are awesome people! I love to see the faces of the riders light up when it is time for the ride to begin. I share their pride when they learn a new skill or master an old one. I love the interaction with horses. 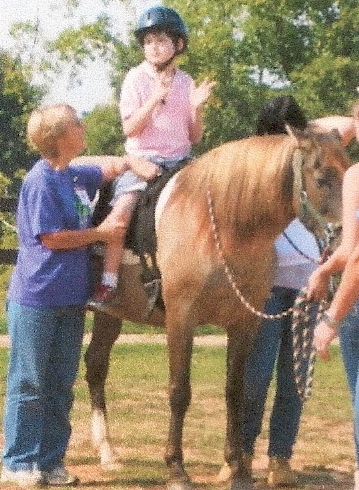 God has infused these chosen horses with gentleness and sensitivity. They seem keenly aware that each rider is special and deserving of their best behavior. All of us- riders and volunteers- share a special bond with the horses. Thanks to Rising Hope Farms, I have dozens of new best friends (some two legged, some four legged). I have mastered many new skills. I love the time I spend out there and get far more out of the experience than I could ever give. When I count my blessings, working at the Farm is at the top of the list! It is truly a life-changing experience.